I have just been putting the 4 waypoints for my course into the two GPS's I'll be taking along! I must say this together with the Saturday news, pushed the excitement levels up a few notches....! Yesterday I met up with three seasoned polar expeditioners, who have done the Messner route, and we went through their experiences of the dangerous crevasse areas with a view to me being able to decide on the route I'll take. I had this mixed feeling of fear and excitement as they spoke through their experiences, but once again I did feel this sense of “I’ll be OK, I have taken on the unknown many times before alone, and provided I use my instinct and experience I’ll be ok!”. The main fear I have is being alone in a whiteout with crevasse around, but now having rehearsed the situation many times in my head, I have to just get out there on DEAL WITH IT! And as I often remind myself, I may never have to, and if Mother Nature feels I have been a good boy, I’ll ski by these crevasse area in perfect weather giving me wonderful views of what her huge power at can do! Gee, this is going to be exciting! 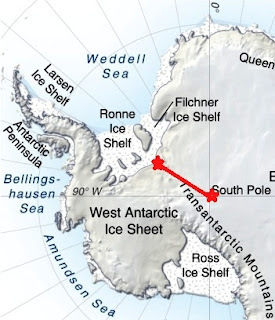 Another issue I have been dealing with today is whether to take a large back pack, the one I used in the North Pole or stick to the much smaller one I had planned for this expedition. “Gee, why is he still undecided about these seemingly expedition critical pieces?” Well, yeah it is a critical, but I know both will do the job, however one will be better than the other: A lighter sled is easier to pull up inclines / over pressure ridges etc, and that’s why for the North Pole I used a big back pack: To make the back breaking job of hauling the sled over the mountainous pressure ridges a bit easier. 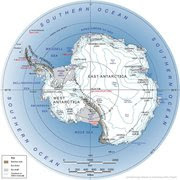 Antarctica is different, smoother and while a climb it’s fairly gentle each day. So the feeling is that one doesn’t need a backpack and everything goes into the sled, or at most one has a small backpack for ease of access to ‘stuff’. Well going solo, means my sled is already heavier than those in a team where team equipment weight, like stoves, shovel, tent, electronics, fuel etc is shared between team members, I have to carry it all myself. Secondly, I am planning to use ski’s that only have fish scales, and not the traditional skins. These are to provide grip to help one climb and have traction to pull the sled. Skins defeat the purpose of smooth gliding ski surfaces, and so slow one’s progress down when skiing is possible. With the fish scales one doesn’t have as much traction as the skins, but the resistance when wanting to ski fast is much lower. So the lighter my sled the better, and so the more I can take in the back pack the better...well to a point, and I’m currently weighing up that point!! Like I have experienced many times before on expeditions, one thinks these decisions have been made months before and put to bed, but as the realities and a bit of fear / apprehension kick in the decisions get revisited. It’s a fascinating mind game! At the moment the small one is still ahead on my preference, based on ease of handling, but how my ski’s perform on the real ice in Antarctica is the test. I’ll probably wait to see how I feel on the ice in Antarctica before making the final decision on the backpack. So that's my little world for now! Gee, and I used to be a big businessman making huge decisions each day, and now indecisive on something seemingly so insignificant and simple! Haha, it feels good for now! It’s because there is little scope for error, and expedition success depends on all these little details....! Already a gripping tale, and you haven't even left yet! Howling SE in Cape Town today, strong enough to clear the weather in the Antarctic for sure, so holding thumbs for your flight tomorrow. Wishing you all the best Howard. Your BJHS "support team" is on board and following your progress! It is very exciting that the weather is clearing and your expedition is almost underway. We are comparing the distance you will be walking to distances in our home countries. Shanghai to Bejing, Calgary to Vancouver, Addis Ababa to Sana, Yemen are all about the same distance as you will be walking. Shuai says, "How are you? Remember to keep walking. If you are tired, rest and eat and them keep walking!" Sabrina says, "Be careful and always wear your winter coat, We don't want you to get sick." We have snow on the ground today for the first time this winter so we think it was waiting for your adventure to begin to help us "feel your cold!" Take care and keep your toes warm!! !